I used Stampin' Up! Number of Years stamp set from the 2016 Occasions Catalog on my card today. For my card, I decided to use the It's My Party Washi Tape and DSP. Using the Balloon Punch and It's My Party DSP, I punched out 6 balloons. On the Whisper White cardstock, I added two strips of washi tape. I stamped the balloon strings using the Balloon Celebration stamp set. I adhered my balloons to the strings, popping up the centered balloon. 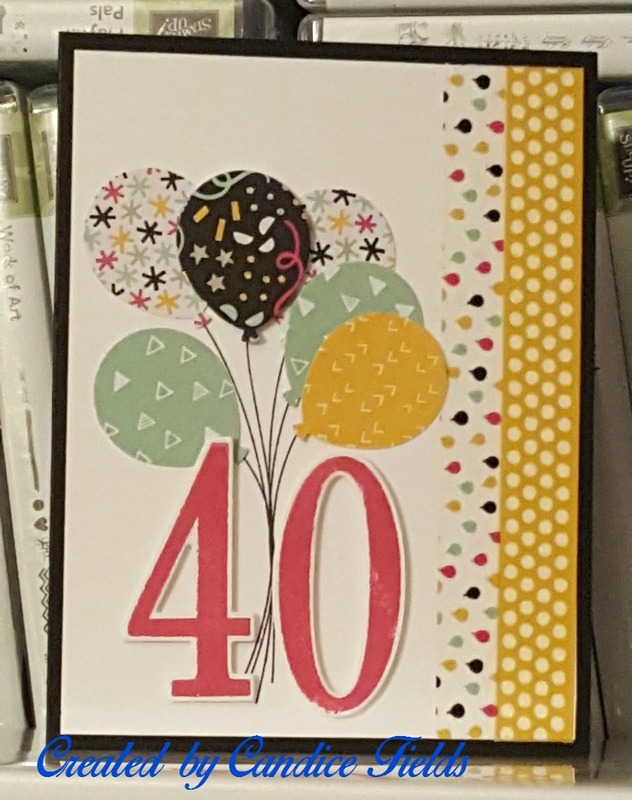 Using the Number of Years stamps and framelits, I stamped and cut the number 40 ad adhered to the card using dimensionals. I added some Clear Wink of Stella. I added the Whisper White layer onto a Basic Black card base. I absolutely love how this turned out!